At Sundog Restoration Studio we understand that family treasures hold special memories; memories of bygone times, events and people. Though we can’t reverse time; we can bring your cherished pieces back to life. 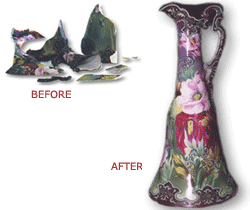 We professionally repair and restore ceramic antiques and objects including fine porcelain, pottery and other three dimensional decorative art. We take your badly damaged items and remove old repairs, reassemble broken pieces, fill missing areas, create parts, match colors, airbrush and hand paint missing detail; bringing equal amounts of technical skill, artistic skill and passion to what we do. Our philosophy regarding the restoration of objects is simple. We strive to provide a high quality restoration that doesn’t alter the original intent of the artist or manufacturer. We pay strict attention to preserving the integrity of the item and honoring the value and sentiment that it holds for you. We keep ourselves informed about new products and techniques. We offer transparency in our treatment process and estimates and we discuss our treatment approach and the associated cost with you before beginning the work.